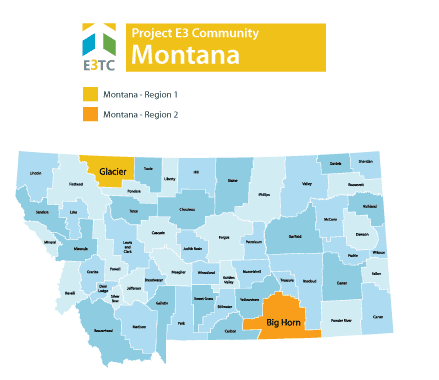 Montana is a location chosen as a targeted community through the Vocational Rehabilitation Technical Assistance Center: Targeted Communities (VR-TAC-TC) or Project E3. Project E3 will partner with State VR Agencies and local community partners to improve outreach and employment-related services to underserved people with disabilities in this community. Montana’s beautiful landscape includes forests, prairies, highlands, and valleys. It includes the Rocky Mountains and the Continental Divide in the western part of the state and rolling plains in the eastern part of the state. Two-thirds of Montana is in the Great Plains. Montana’s economy is primarily based on agriculture, including ranching and cereal grain farming. Other significant economic activities include oil, gas, coal and hard rock mining, lumber, and the fastest-growing sector, tourism. Health care, service, and government sectors are also significant to the state’s economy. In 2011,Montana ranked third in the nation in number of craft breweries per capita. The population in Montana is distributed over a large geographic area. Montanians living in rural areas face unique challenges to both accessing services and finding employment. These challenges are compounded for those living with disability and poverty. Counselor Motivational Interviewing (MI) Training:Provide opportunities for vocational rehabilitation counselors to access training on Motivational Interviewing. Motivational interviewing is an evidence-based counseling method used to help people resolve ambivalence and develop internal motivation to change behavior. Job clubs: Job clubs give job seekers the chance to meet and share information about the job search, the application process, and interviews. They can practice their job and social skills with one another to gain skills and confidence. Project E3 will provide Montana’s state Vocational Rehabilitation agencies and their partners with the skills and competencies needed to effectively and efficiently address barriers to competitive integrated employment and community integration encountered by persons with disabilities in these regions. We will leverage promising practices, knowledge, and experience gained from this project to expand employment opportunities for individuals with disabilities from underserved and economically disadvantaged populations throughout Montana and across the United States. Increase the percentage of individuals with Individual Plans for Employment who obtain and retain integrated, competitive employment.